The Cornilleau 'Turn 2 Ping' Outdoor Weatherproof 9' x 5' conversion table tennis tops simply sit on top of a patio or outdoor pool table etc. to create a full-sized outdoor table tennis table. The two halves are each 4' 6” x 5' and the set includes a clip-on net and post set. Conversion tops are simply held in place by gravity so it's important the supporting table is at least 3/4 of the size of the tops to provide a safe base. It's also essential for the supporting table to be slightly narrower than 5 feet as you'll need a couple of inches each side to clip the net post on (the clamps would not fit over both the table tennis top and the table below). Please bear in mind that each half weighs around 20 kilos and that we recommend 17’ x 11’ as a comfortable play area. The tops have a 10 year warranty. 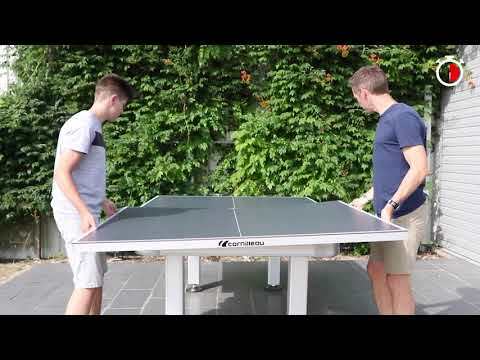 Cornilleau are the first to offer outdoor conversion tops (that we know of) and it's a great way to add an outdoor table tennis table if you've limited space. However the price of the conversion tops is very close to the cost of a complete Cornilleau rollaway table so if you've a large enough area you'll find it more convenient and more versatile to have a fold up, rollaway table.